A smoky and savoury dark made with cocoa beans from the Solomon Islands. 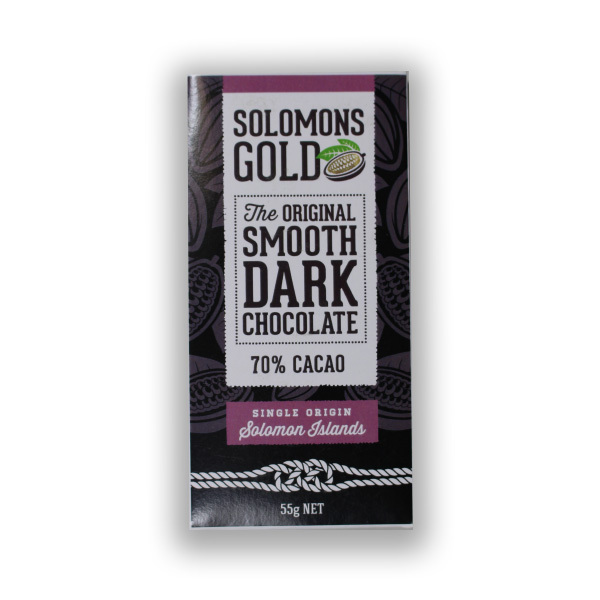 The arrival of this 70% dark chocolate bar from Solomons Gold represents two firsts for Cocoa Runners. Not only is it our first bar made using beans from the Solomon Isles, Solomons Gold is also the first chocolate maker we have brought you from New Zealand! This is a seriously intense and savoury dark chocolate. The chocolate has little to no fruit but instead is infused with a seriously smokey aroma. The flavour is not so much nutty or roasted as a big blast of woodsmoke. Wooded hints of tobacco, rough leather and saddle soap drift under the smoke. The strong flavours counteract any sweetness, making this an intense and unique tasting experience. The strength of flavour is comparable to much higher percentage bars. Lying between Papaua New Guinea in the west and Vanuatu in the southeast, The Solomon Islands is made up of six main islands and over 900 smaller ones. In the area where the cacao is grown the soil is volcanic. Solomons Gold believes that it is the particular make up of the volcanic soil that give the beans their smokey quality. This chocolate achieved a Silver at the Academy of Chocolate Awards 2017.